Passive Income Vs Residual Income What are their true definitions? Instead of having to work, you can work because you choose to, or you could decide not to work for however long you want to. Get a good job usually corporate. Take out loans for school, cars, and a house. Work hard till your over 65 years old to pay off those loans. Try to put away for retirement during those years. Realizing saving is harder than one realizes with all the things that happen to us. These things are called “Life” nothing goes as planned. Truth is you don’t have to play in the same sandbox as everyone else. Being different and learning how to manage your money is the smart way to go in life. Using your money to make more money will lead you down the road to freedom. Is that a freeing thought or what? For me it is. Living on someone else’s terms having to work living paycheck to paycheck is no way to live life. Passive Income with multiple streams of income is the way to live life. Having to get up every morning to an alarm clock ringing. Get showered and then fight rush hour traffic. To then put up with a boss while you make someone else richer. This is not the way to live life. Sometimes I think words are taken out of context only to confuse everyone. Kind of like the telephone companies do and did with their phone bills. They would put enough charges with codes and carryovers from page to page just to confuse the customer so they never understood their bill. The telephone company getting paid month after month and the consumer oblivious that they were getting taken because the bills were too confusing. Paid month after month is that considered Passive Income or Residual Income? What’s Active Income and Linear Income are they related to passive income? It starts to get confusing real quick…………. Passive Income is the result of cash flow received on a regular basis after the work has been completed. It usually requires very little to no effort by the person being paid. If that is Passive Income What is Residual Income? This is where it starts getting sticky….. Some people define residual income as money you get paid after the work is done. The actual definition of the word residual means money left over after you pay your bills. Now in the past TV actors and musicians have earned residuals on their shows that continued to air. This is where the definition of residual income comes in to play today. Network Marketing companies have used the example of the TV actors and musicians to change the meaning of residual income to fit their industry. People are using residual income to mean income you continue to get paid after the work is done. Which is the same definition as Passive Income? Network marketing or MLM used the term residual income and changed its meaning from money being leftover to money coming in after work has been done. Not to be the judge and jury but Passive Income is more of what the Network Marketing groups are explaining. Work so much and continue to receive overrides on the teams you built. Residual Income, in my opinion, is money left over after you deduct your expenses. 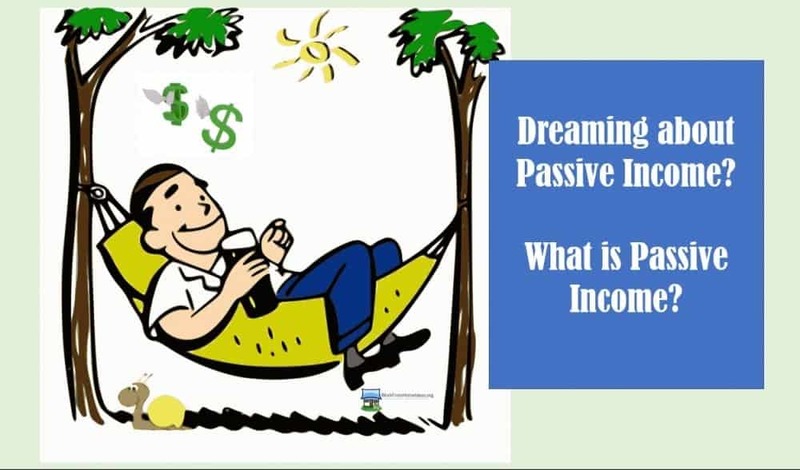 Passive income definition is receiving money on a recurring basis and continuing to receive this money. The money usally requires very little to no effort to keep bringing in these monthly or yearly payments. So What's Active Income Vs Linear Income? Active Income means you trade your time to earn money. Active income arises as a direct result of your efforts. When you work for one hour and then get paid a set amount for that hours work. This is commonly known as wages, salaries. The sad part is active income is limited because no matter how much money you get paid you still need to show up. If you don’t show up, you don’t earn anything. Linear Income’s definition is also related to the number of hours you work. You only get paid for the amount of time you work. Multiple streams of income is the way to go if you’re looking for financial security. Here on Work From Home Ideas, we will be working on lists of passive income ideas that you can use to start making money with. Some require more capital than others to start. For instance, Real Estate has always been one of the best ways to build passive income along with having a healthy investment portfolio. A new passive income opportunity is through the use of the internet and technology. This is a passive income you can start today! It is relatively simple and costs very little to start building. Think of online as the virtual real estate. Multiple streams of passive income are truly the way to live life. Then you can work any profession and not have to worry how you’re going to pay next months bills. The younger you start the better off you will be, but that doesn’t mean us older folks are left out either. Being older and wiser means you have more to share with the world. This will make it easier for you to build online passive income.